Bainbridge Island is an small island of 20,000 population and the only way is by scenic 35-min ferry boat from Seattle. Once you are on the ferry you can get out and check out the beautiful scenic views. Learn about Japanese history regarding the internment from a personal perspective. If you are planning to go to Seattle, adding a trip to Bainbridge Island will be worth it to see the beautiful and very special Japanese American memorial. You will have to do some planning. First check the ferry schedule in Seattle in our list below. You probably want to take your car on the ferry. It's about 4 miles or a 15 minutes drive by car minutes from the Bainsbridge dock to the memorial. There is a option to take a bus but will take much longer. Once you are on the ferry you can relax and see the beautiful scenic views. Once you get to the island, you can walk and explore main street (Winslow Way E) for food and shops. One of the best places to live in the U.S. according to "MONEY magazine and CNN/Money"
Next explore the Bainsbridge Museum and Japanese American Memorial. Tip: Free Guided Tours - 3 Weeks Notice: contact the Bainbridge Island Historical Society at 206.842.2773 or info@bainbridgehistory.org, indicate the size of your group, date, time, and duration of your visit. The Bainbridge Island Japanese American Exclusion Memorial is an outdoor exhibit commemorating the internment of Japanese Americans from Bainbridge Island in the state of Washington. It is a unit of the Minidoka National Historic Site in Idaho. Japanese immigrants first came to Bainbridge Island in the 1880s, working in sawmills and strawberry harvesting, and by the 1940s had become an integral part of the island's community. Because of the island's proximity to naval bases, local Japanese Americans were the first in the country to be interned; 227 Japanese Americans were ordered to leave the island with six days' notice. They departed by ferry on March 30, 1942. Most internees were sent to Manzanar, CA, though some were later transferred to Minidoka, Idaho. Local newspapers such as the The Bainbridge Review (made famous by the novel and film Snow Falling on Cedars) spoke out against the internment and continued to publish correspondence from internees. A Seattle Post-Intelligencer photograph of Bainbridge Island resident Fumiko Hayashida and her 13-month-old daughter preparing to board the ferry that day became famous as a symbol of the internment. About 150 returned to the island after the end of World War II. By 2011, about 90 survivors remained, of whom 20 still lived on the island. The memorial wall winds solemnly down to the historic Eagledale ferry dock landing site, where the first of more than 120,000 Japanese-two-thirds of whom were American citizens-were banished from their West Coast homes and placed in concentration camps during World War II. The memorial is a reminder-"Nidoto Nai Yoni" (Let it Not Happen Again)-of what happened on March 30, 1942. The first part of the memorial to be constructed was an outdoor cedar "story wall" with the names of all 276 Japanese and Japanese Americans resident on the island at the time. 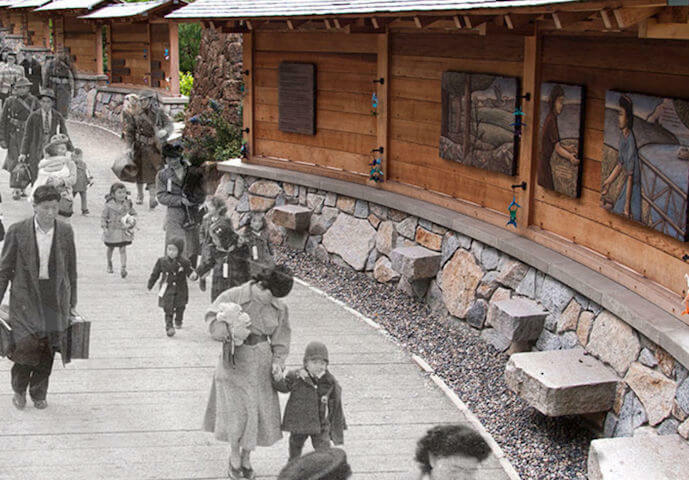 Built of old-growth red cedar, granite and basalt, the wall honors the names of all 276 Japanese and Japanese Americans who were exiled from Bainbridge Island by President Franklin D. Roosevelt's Executive Order 9066 and Civilian Exclusion Order No. 1. It also celebrates this island community, which defended its Japanese-American friends and neighbors, supported them while they were away, and welcomed them home. The wall was designed by local architect Johnpaul Jones, an American Indian and the principal of Jones and Jones Architects. The grounds of the memorial wall is natural landscaping, native species including sword fern, mahonia, salal, and shore pine. Local artist Steve Gardner created friezes to be placed on the wall, depicting some of the scenes of residents being herded onto the ferries; he stated that the project "sucked me in in a way I hadn't thought about. This really is a story about American citizens." The memorial was opened to the public on July 30, 2011.